There are six colour handles for your need, white, red, blue, pink, purple, rose red. 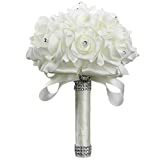 Starworld Handmade Bridal Bouquet is perfect as wedding flowers, very beautiful flowers for wedding, birthday, party or other occasions. Soft foam material provides you a comfortable grip.